Bitterroot Buggers is calling for volunteers Tuesday, 3/16/10! We need your help again for the 4th class! Not a tier? No worries! that keep the class running smoothly! Tuesday, 3/16, 6:30 – 8:00 PM in the Westview School gymnasium located at 9th and Main in Hamilton. Enter through the east doors facing 9th St.
Don’t forget to pick up a raffle ticket each night you help – there will be a drawing for volunteers in April for a framed Monte Dolak print valued at over $300. The more you attend, the better your chances! We’ll be judging flies each night for those students choosing to enter. Be sure to pick up a judging criteria sheet when you arrive. See the slideshow below of photos taken by Greg Chester. If you see yourself in a photo, leave a comment. If you want to see yourself in a photo, come on down! In early March, you can start looking for Skwala stoneflies. They are similar to salmonflies in appearance and habitat, though they are smaller. The Skwalas are related to the little yellow stoneflies though they do not belong to the same biological family. For more information about the Skwala hatch, give us a call. Here are some photos of skwala we saw on the Bitterroot River a few days ago. See the slideshow below. 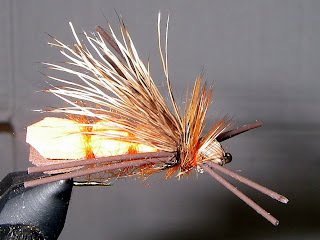 Billy Burk sent photos of these flies he tied. Jack thinks he did a good job on them. Hey Merle! Just a note to say hi, and run my pattern past Jack for this years’ trip. Attached is my attempt at copying a leftover fly from our trip 2 years ago. The hook size is 8, barbless. I think it actually looks pretty good, (considering the source). In the “Banana Belt” of western Montana, anglers not only have one of the longest fishing seasons in the state but also some of the finest dry-fly fishing at a time the fly fisherman needs it the most – in early spring. Flowing through the heart of the Bitterroot valley, the Bitterroot River has a hatch that has excited anglers for a couple of decades particularly after many articles have been published. Obviously, it is no longer a secret. I am talking about the skwalla stonefly hatch. The hatch is actually one of the several important insects to emerge in a typical western Montana spring. The skwalla draws attention to the largest trout in the river and the beauty of it all is that it is top water fishing. In my mind anyone can (and frequently does) put on a bobber with a nymph pattern and fish to the large trout — even using skwalla nymph patterns. But to fool large trout on the surface in the right conditions is what our spring fishing is all about. Knowledgeable, observant anglers pay attention to the natural world around them. The phenological events of spring are indicators for the fisherman. We watch for the appearance of buttercups, biscuitroot, pasque flowers, and glacier lilies on the hillsides. The robins, western meadowlarks, and western bluebirds are giving us a reminder that it is time to fish. 1. Phenological: the relationship between a regularly recurring biological phenomenon and climatic or environmental factors that may influence it. Here are photos of a few of my favorite fly patterns that have evolved over three decades of spring fishing on the Bitterroot and Clark Fork. In guiding fly fishers over the years, I’ve noticed that clearly the single most important criterion for clients fishing out of a boat is fly visibility. Many great all-purpose and attractor dry flies work extremely well. 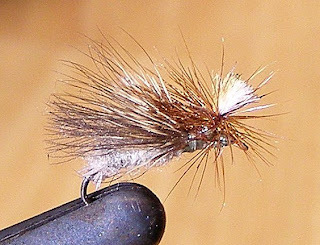 Various colored Wulffs, humpies, parachutes, and the elk hair caddis come to mind — all proven patterns that catch lots of trout, but are not always easy to see. Another great all-purpose pattern is the Down-Wing Drake, developed by Phil Wright — nothing more than a grey thread body, a deer hair tail and down-wing, and a grey hackle wrapped forward of the down-wing. It’s a wonderful caddis and mayfly imitator. The only problem is that neither tired old eyes nor younger eyes accustomed to perusing the Wall Street Journal can see it. Parachute dry flies are great, too. One can drag them around to the feeding lanes and they usually don’t sink or tip over. They seem to land with their wings upright most of the time and are easily seen with the naked eye, especially if tied with orange poly pro yarn or various colors of antron body wool for the upright wing. The high-visibility orange parachutes have been on the market for many years in various incarnations. I’ve experimented with different down-winging schemes for a hi-vis orange, hot pink or white caddis parachute. Feedback from stubborn, hard-headed guide associates and friends has been extremely important in determining which combinations work best. In addition, I have had the opportunity to watch numerous clients of varying skill try them under differing water and light conditions. Thus has evolved “Banjo Jack’s Parachute Caddis.” Orange and hot pink seem easier to see under a sunny sky, while antron white seems to show up best under cloud cover. By tying in a small clump of dark to medium-dark deer hair down-wing style behind the parachute wing, I’ve found an excellent caddis and /or mayfly emerger that is easy to see. Early to mid-summer fishing on many western waters can find both caddis and mayfly species throughout the day and Banjo Jack’s Parachute Caddis fits the bill in a variety of sizes and body colors. I’ve varied body materials using both synthetic and natural materials, but peacock herl and hare’s ear dubbing ride low on the surface film and have proven very effective. A wire rib greatly increases the durability of the herl. You can vary the materials and even try a short tail of marabou or sparkle yarn. Give this pattern a chance and I’ll bet you will enjoy the results. It is particularly good in smaller sizes, like 16’s. Start at the eye. Give head a good bed of thread and bring thread toward the eye of the hook. Pull up the yarn into a post-wing and use 10 clockwise wraps around the base of the post; then reverse the thread and put on ten counter-clockwise wraps; don’t trim the wing top. This forms a sturdy base for wrapping the hackle. Move the thread to the back of the hook and tie in the body materials, e.g. three strands of peacock herl and some fine copper wire. Wrap the thread back up to behind the wing. 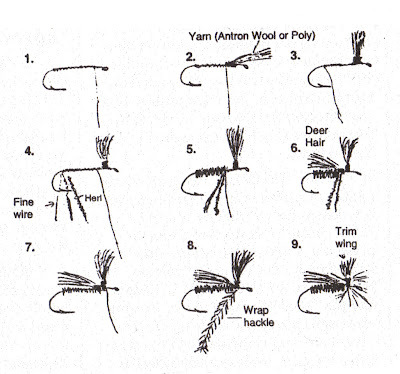 Wrap the herl to behind the wing, but don’t crowd the wing and don’t cut the herl strands. Then wrap the wire to rib the body and trim the wire. Next take a sparse clump of deer body hair (flank or shoulder area) and trim the butts evenly. Trim so that the ends won’t extend too far beyond the end of the hook. Tie in the down wing firmly. Wrap the herl over the butts and under the orange wing, then tie off. 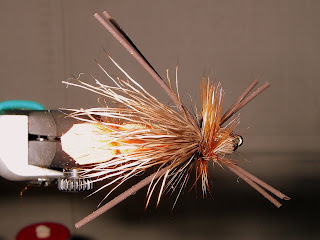 Tie in a grey dun or grizzly hackle sword and wrap parachute-style around the base of the orange poly wing. Five or six turns will float the fly just fine. 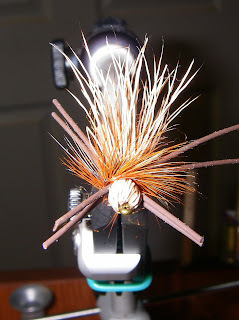 Whip-finish the head, cut the thread and trim the orange wing fairly short.